Toronto might not technically be home to world-class skiing like its west coast cousins Calgary and Vancouver. But believe it or not, there are actually plenty of hills that are only a few hours away from the city that are more than worth a shred. From Northern Ontario and Quebec to Vermont and Upstate New York, we’ve rounded up 20 incredible ski resorts that are all within a day’s drive of Toronto. So dust off your skis or wax your board, it’s officially time to hit the slopes. Mont Tremblant features a quintessential village that was built in the style of Old Quebec, with narrow cobbled streets that surround the base of the mountain. The mountain is ideal for all levels and features a variety of slopes. The resort’s nightlife is almost as sought after as its slopes. Spanning over three mountains, Mont Orford is located in Mont-Orford National Park. Known for its long trails and tight tree skiing, there’s something for everyone to do. From snowboarding to skiing, to terrain parks and a halfpipe, Mont Orford is just six and a half hours from Toronto. With scenic views of Calabogie Lake, this ski resort is only four hours from Toronto and offers a mixture of both beginner and intermediate runs and some of the best runs in the surrounding area. Located just under six hours from Toronto, Mont Ste-Marie doesn’t just boast the biggest vertical in the area it’s also home to a great mix of runs ranging from easy to expert and a killer après ski amenities. Only six and half hours outside of Toronto, Mont Sutton is a winter playground that’s home to 60 trails, nine lifts, and a snow park. If skiing or snowboarding aren’t your thing, the village is filled with a variety of accommodations, fine dining options, and charming cafés and bistros that truly sets the Eastern Townships apart. Mont-Sainte-Anne is a year-round mountain destination located within the Laurentian mountain chain about 30 minutes outside of Quebec City (8.5 hours from Toronto). The ski resort features 71 trails, four terrain parks, and is known for its spectacular scenery, long groomed trails, and family friendly activities. The ski area contains a wide mix of terrain that ranges from beginner to advanced. Just a little over four hours from Toronto and just 20 minutes from Ottawa, Mont Cascades is geared towards all levels of skiers and snowboarders and is comprised of 20 scenic runs. It’s beginning to look a lot like winter! Have you voted with @bluemtnresort on when #openingday will be? Located along the shores of Georgian Bay, Blue Mountain is the area’s largest ski and snowboard resort. For those not interested in hitting the slopes, there’s tubing, skating, snowshoeing, mountain coasting, and spas galore. Just a quick drive north of the city, Hidden Valley has been providing Torontonians with unparalleled winter fun since 1965. Nestled in the heart of Muskoka just east of Huntsville, Hidden Valley features runs that are perfect for all skill levels and consistently great snow conditions. Located just under an hour from Toronto, Hockley Valley is home to 15 scenic runs of all difficulties and a terrain park for the more experienced riders. For those not interested in mountain activities, the resort offers everything you could need to unwind such as accommodations, a luxurious spa, and plenty of dining options. Lakeridge Resort is nestled in the beautiful Oak Ridge Moraine and offers year-round fun for everyone. Featuring 23 runs, this resort offers a wide range of trails for skiers and snowboarders, from novice to expert, including mogul runs, a half-pipe, three dedicated snowboard terrain parks, and a separate snow tubing park. Just under two hours north of the city, Glen Eden is home to 12 slopes, two half pipes and five lifts. For the city folk who don’t have access to a vehicle, this mountain is great because it’s reachable by public transit. Nestled in the heart of Kitchener lies Chicopee Ski and Summer Resort. The mountain offers 12 scenic runs, lessons for all skill levels, winter camps, and a racing league for those looking for more of a challenge on the mountain. Less than two hours north of Toronto, Mansfield is a ski resort for all skill levels. Boasting 17 runs, three terrain parks and plenty of engaging social events to check out, Mansfield has something for everyone. Just under eight hours from Toronto, Okemo Mountain Resort is a popular ski destination for both Canadians and Americans alike. Known for its exceptional runs, quality grooming terrain parks, family programs, resort dining, and friendly and professional guest service, Okemo Resort needs to be at the top of your ski and snowboard bucket list. Another great resort to check out in Vermont that’s under eight hours away is Sugarbush Resort. With six distinct peaks, 2,000 acres of backcountry, and over 1oo runs of varying skill levels, this is another resort that offers unparalleled mountain experiences. For those looking for a classic New England experience, head to Killington Resort, which just so happens to be the largest ski area in the Eastern United States, and the largest vertical drop in New England at 3,050 feet. Feature 155 scenic trails, six terrain parks, and a half pipe, this is a resort that snow aficionados need to pay a visit. Just over seven hours from Toronto, Windham Mountain is known as a family friendly resort offering an authentic ski and snowboard experience. Boasting 52 trails, a 1,600 foot vertical, and five terrain parks Windham Mountain is definitely a must ski for Torontonians. 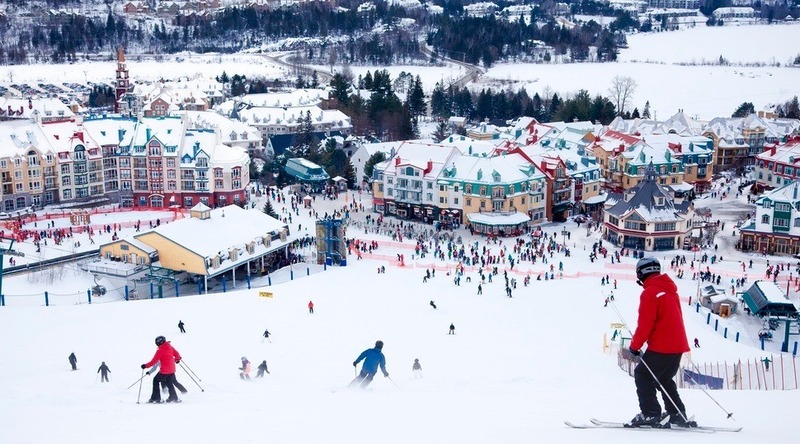 Just under seven hours from Toronto lies Gore Mountain, which is arguably one of the best ski resorts in New York. Boasting a vertical drop of 2,537 feet and 446 accessible acres, the resort offers skiers and riders 119 trails and nine cross-country and snowshoe trails that are great for all skill levels. Located just seven hours from Toronto, Belleayre Resort offers something for everybody, from skiing to snowboarding to cross-country skiing. Offering 50 scenic runs and two terrain parks, Belleayre is a great place to teach your kids how to ski or perfect your downhill moves.